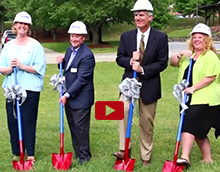 The Wildcat community celebrated the ribbon-cutting and grand opening of Carolina Day's renovated Lower School for the 2016-17 school year: now named Love Hall, and including Oreck Library, Owen Academic Wing, and the Alumni Gym. More than 300 attendees toured the new facilities and enjoyed food and music in the Lower School Courtyard. Built in 1956 as Asheville Country Day School, the Lower School was the oldest facility on campus. Through the “It All Begins Here” campaign, Carolina Day raised more than $5 million. The Lower School campus has been transformed by creating dynamic, learning-centered classrooms; a new, state-of-the-art library; a reception area; and an enhanced gym and community gathering spaces. Love Hall features interactive, learning-centered classrooms that create spacious environments for individual and collaborative student learning. The new classrooms, designed with our teachers' input, reflect their vision and best practices for inquiry-based learning. The design also features flexible space to connect classrooms for grade-level learning and presentations. There are new public galleries to highlight and display student work, and there is access to the outdoors for hands-on learning experiences. Oreck Library is in the heart of the campus, integrating knowledge and technology throughout the CDS learning experience. New methods for research and access to information and books transform our students’ preparation for the rapidly changing workplace. There are digital and print resources for research, learning, and collaboration. Spaces are available for individual, small group, and division learning. Students can enjoy age-appropriate reading and studying areas, plus new community space for meetings and events. Alumni Gym, formerly known as the Lower School Gym, has been upfitted with new windows, bleachers, climbing wall, air conditioning, stage improvements, increased storage, flooring, and lights. 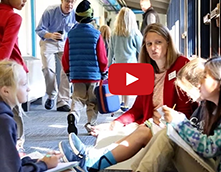 Every day at Carolina Day School, Lower School students are engaged in meaningful work supported by outstanding teachers who inspire, challenge, and invite them to grow. CDS students are empowered to apply their knowledge and skills to collaborate, problem-solve, design, and create. The new Love Hall facilities appropriately accommodate the innovative, inquiry-based teaching and learning that occur every day on campus. 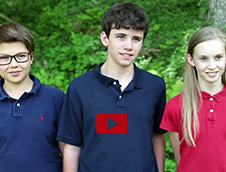 It All Begins Here set the stage for the next chapter in Carolina Day School’s proud history. If you are considering enrollment at Carolina Day, contact Admission Director Debbie Ashe for a tour of campus to learn more about these exciting changes.